For 95 years since its establishment, Nakagawa Precision Machinery Work has been tackling Its work while bearing constantly in mind the need to bring the perfectionism of “craftsman’s technology” to bear in its manufacturing activities. 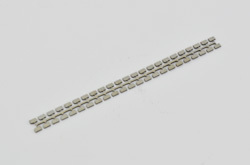 In 2004, the company was certified under the Osaka Prefectural Management Reform Support Law as a “constructor of lathe-processing technology for thin-walled products.” By skillfully integrating traditional craftsman’s processing technology that has been handed down for generations with the most advanced NC processing technology, we are responding to a wide range of needs for thin-walled product lathe processing and other machine processing techniques that can be used from the trial manufacturing stage. Ever since its establishment in 1917, NAKAGAWA Precision Machinery WORKS CO., LTD. has been concentrating its energies on machining work. Recently, the company has established a new policy of “integrating craftsman’s processing technology and NC processing technology” and is implementing it on a daily basis. Please feel free consult Nakagawa Iron Works casually on anything related to parts machining. Does your company have any problems related to lathe processing of thin-walled products? 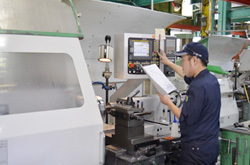 Nakagawa Precision Machinery Works carries out a wide range of machining tasks by adeptly integrating tried-and-tested craftsman’s technology with the latest NC processing technology. We are ready to challenge difficult tasks. For example, even in the case of items that are impossible to grip with a chuck, we can process them by using specially constructed jigs. However, depending on the nature, shape or tolerance of the material being worked, here are some instances in which we can’t guarantee the highest levels of precision. (In some cases, we may ask the customer to reconsider whether to perform trial manufacturing or mass production.) 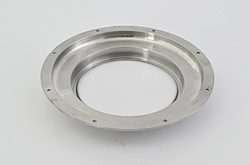 Aluminum, in particular, requires a rather high level of technology due to its thermal expansion and machining deformation characteristics and inherent material stress. You may be forgiven for thinking that wire cut processing is a method employed exclusively for dies. This is not the case.The images below show examples of products made using wire cutting together with a machining center. The recent progress in machining center and cutting tool technology has been nothing short of remarkable.However, regardless of how far conditions improve, given the problems of the raw material’s material deformation, processing deformation caused by processing stress, etc., in the present situation it remains difficult to produce machined products to a satisfactory degree of precision.To improve this situation, we are introducing a processing method that combines wire cutting and machine center processing. In addition, we are introducing processing based on DXF file data and integrated processing using lathe and wire cutting technologies. Copyright© Nakagawa Precision Machinery Works Co., Ltd. All Rights Reserved.